Titanium is by far one of the most popular metals featured in luxury watches today. The metal’s lightweight characteristics, durability and hypoallergenic qualities are factors to consider when selecting a timepiece, not to mention essential elements for your watch collection. 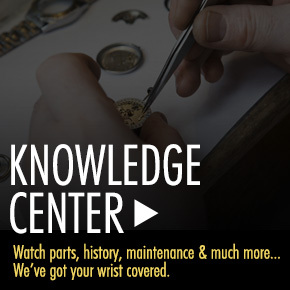 Titanium is a relatively new metal that has been used in the craftsmanship of watches for less than twenty-five years and is more desired by many watch collectors than stainless steel and even 14K and 18K gold. In the late 1990’s, Swiss watchmakers TAG Heuer and Breitling were the first to introduce titanium models in their collections. 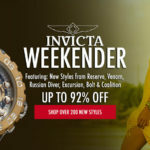 Numerous watchmakers, including Corum, Oris, Invicta, Swiss Legend, TW Steel, Citizen, Fossil, MOMO Design and Fossil followed suit. Titanium is incredibly lightweight and far more comfortable to wear on the wrist over extended periods of than either stainless steel or gold. This is an exceptionally advantageous when wearing one of today’s bold, oversized men’s watches, most of which measure over 48mm in diameter and more than 15mm thick. 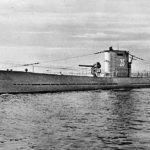 What’s more titanium is a stronger metal and far more durable than both gold and stainless steel. It does not dent easily or scratch and it is highly hypoallergenic… an ideal metal for anyone who is allergic to gold or steel. Titanium is also the first choice for a diving watch, since it is highly-resistant to corrosion in sea water and chlorine. The only minor drawback to owning a titanium watch is the metal’s lightweight almost flimsy-like feel, a trait easily outweighed by its numerous benefits. 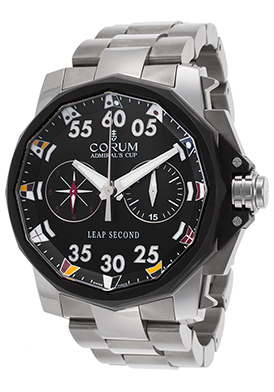 The Corum Admiral’s Cup Leap Second Automatic chronograph is an excellent titanium watch choice. This premium-crafted Swiss-made automatic men’s watch features the twelve-sided, dodecagon shaped case in brushed titanium. The matching brushed and polished multi-link bracelet in titanium has a convenient push-button clasp closure. The black rubber dodecagon shaped bezel frame the black dial with two sub-dials, luminous hands and hour markers. Features include 1/8th of a second and 30 minute registers along with a decorative flag emblem at each hour marker. Additional features include a scratch-resistant sapphire crystal above the dial, along with water-resistance to 100 meters. Corum men’s watch is 48mm in diameter and 18mm thick. 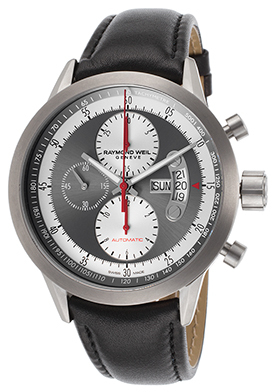 The Raymond Weil Freelancer Automatic Chronograph is a more distinguished titanium watch selection. This handsome and elegant Swiss-made men’s wristwatch features the perfectly round 45mm diameter, 14mm thick case in brushed and polished titanium, presented on an attractive black leather strap with a deployment clasp buckle. The integrated stationary titanium bezel encircles the gray and white dial with a tachymeter outer dial, three sub-dials and luminous hands. Features include a day date calendar, small-second, 30-minute and 12-hour registers. An exhibition skeleton case back let you see the intricate Swiss-made automatic movement inside. Additional features include a scratch-resistant sapphire crystal above the dial and water-resistance to 100 meters. You do not have to look any further than the Oris Limited Edition ProDiver Col Moschin timepiece for the perfect titanium diver’s watch. This Swiss-made men’s watch pays homage to the prominent Italian Special Forces 9th Parachute Assault Regiment and features the high-performance titanium case, presented on a sturdy black rubber strap with a convenient push-button clasp. 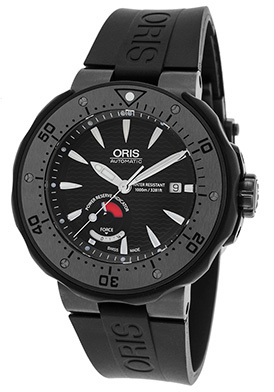 The patented bidirectional rotating bezel in tungsten and black rubber features the Oris Rotation Safety System for efficient dive time countdowns. The legible black dial features luminous and hour markers, a date window and power reserve indicator. A locking screw-down crown and case back provide water-resistance to 1,000 meters or 3,300 feet. 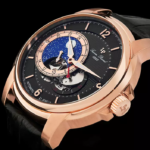 Additional features include a helium escape valve on the case side and scratch resistant sapphire crystal above the dial. Oris ProDiver watch is 49mm in diameter and 16mm thick. The fully integrated bezel surrounds the black dial with three sub-dials, luminous skeleton hands and baton hour markers. Features include a date window at the 4 o’clock hour, small-second, 30-minute and 10-hour registers. Additional features include a scratch-resistant sapphire crystal above the dial and water-resistance to 100 meters or 330 feet. 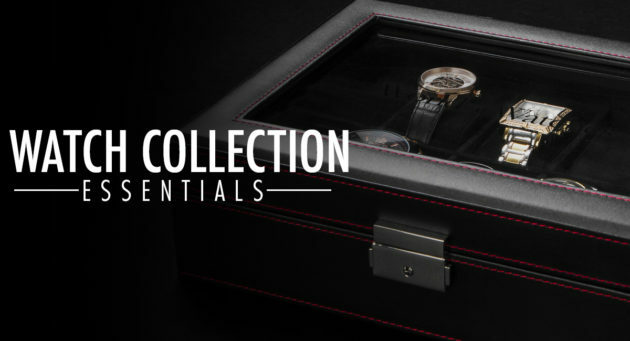 Premium Swiss-made quartz movement inside provides precise time-keeping accuracy. 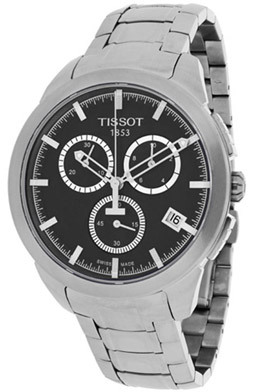 Tissot men’s watch is 43mm in diameter and 11mm thick.